Morning after breakfast proceed for city sightseeing tour of Delhi visiting Old & New Delhi. OLD DELHI - A sight-seeing tour of Old Delhi would entail visiting the Raj Ghat - the memorial site where Mahatma Gandhi was cremated; Jama Masjid - the largest mosque in India. 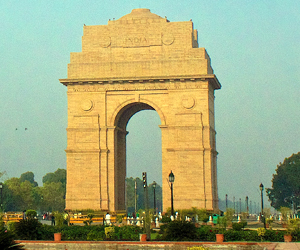 NEW DELHI - An extensive sight-seeing tour of New Delhi would include a visit to the Qutub Minar, a drive along the ceremonial avenue - Rajpath, past the imposing India Gate, Parliament House, and the President's Residence and would end with a drive through the Diplomatic Enclave. Night stay in Delhi. After breakfast departure transfer to railway station to board the train for Udaipur. Arrive Udaipur transfer to the hotel. Night stay in Udaipur. After breakfast proceed for city sightseeing tour of Udaipur visiting the city is built in 1559 A.D. by Maharaja Udai Singh and has been described the most romantic spot on the continent of India by Col. James Todd. Visit the city Palace Museum, the Jagdish temple, Sahelion ki Bari (Queen’s resort for their friends) Bhartiya Lok Kala Mandir (Folk Art Museum) and the Pratap Memorial. Also enjoy Boat ride at Lake Pichola. Night stay in Udaipur. After breakfast drive to Jodhpur en-route visit Ranakpur visit the world famous Jain Temple Ranakpur. The exceptionally beautiful Ranakpur complex is one of the largest and most important Jain temple in India. The main temple is the Chaumukha Temple, or Four Faced Temple, dedicated to Adhinath, built in 1439, this huge, superbly crafted and well-kept marble temple has 29 halls supported by 1444 pillars, no two alike. After visiting continue drive to Jodhpur. Arrive Jodhpur and check-in at hotel. Night stay in Jodhpur. Morning breakfast and drive to Jaisalmer. Arrive Jaisalmer and check-in at hotel. Rest of the day at leisure. 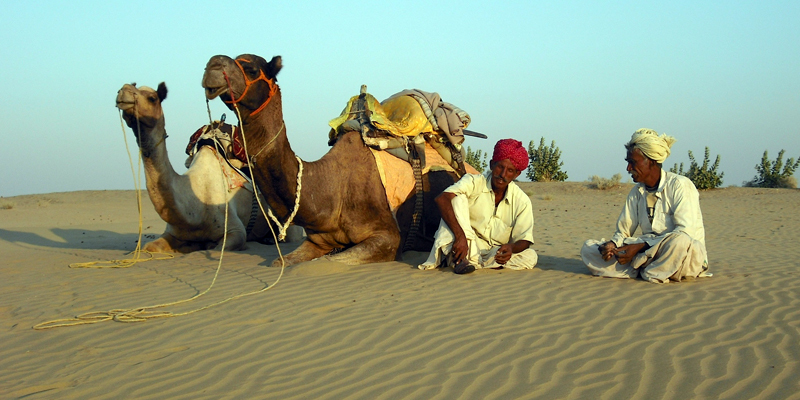 Night stay in Jaisalmer. Morning after breakfast drive to Khimsar. Arrive Khimsar transfer to the hotel. Later proceed for city sightseeing tour of Khimsar. Khimsar is steeped in history- founded 2500 years ago by the Jain Saint Mahaveer; this is the starting point of the great Indian Desert tours. The founder of the castle, which was built in mid 15th century, was Prince Karamsi, son of Jodhpur and very close to other places of interest like Osian and Nagaur. Well managed Khimsar Fort provides the visitors with all modern amenities- 50 luxuriously furnished rooms, theme dinners, a variety of continental and Indian meals as well as traditional Rajasthani are available. Enjoy Jeep Safari. Night stay in Khimsar. Morning after breakfast drive to Jaipur en-route visit Pushkar and Ajmer. PUSHKAR - Visit Pushkar boasts temples, though few are as ancient as you might expect at such an important pilgrimage site, since many were deserted by Aurangzeb and subsequently rebuilt. The most famous is the Brahma Temple, said to be one of the few temples in the world dedicated to this deity. It's marked by red spire, and over the entrance gateway is the hans, or goose symbol, of Brahma, who is said to have personally chosen Pushkar as its site. Ajmer - visit the famous Dargah of Sufi Saint Hazrat Khwaja Moinuddin Hasan Chisti. The shrine is next only to Mecca or Median for the Muslims of south Asia. Akbar used to make a pilgrimage to the Dargah from Agra once a year. After visiting Continue drive to Jaipur. Arrive Jaipur transfer to the hotel. Night stay at Jaipur. Morning after breakfast and drive to Agra en-route visit Fatehpur Sikri , a perfectly preserved red sandstone “ghost town” which was the estranged capital of mughal emperor Akbar, built in 1569 and deserted when its water supply failed. Arrive Agra and check-in at hotel. Later proceed for city sightseeing tour of Agra; the home of the immortal Taj Mahal, the inimitable poem in white marble is the first expression of love of an Emperor Shahjahan for his queen Mumtaz Mahal. This great monument was completed in 1653 AD. Agra Fort, the imposing structure on the banks of the river Yamuna is replete with priceless examples of craftsmanship in the Mughal period, including the beautiful pearl Mosque; it was designed and built by Emperor Akbar in 1565 AD. Night stay in Agra. Morning after breakfast drive to Delhi. Arrive Delhi and departure transfer to the airport to board the flight for onward journey. Tour ends with sweets memories.